Thomas Sowell is my favorite author. It was my great fortune to have stumbled upon his books in the mid 90’s. Dr Sowell has the ability to make complex concepts understandable to regular people like you and me. He digs into statistics from various studies and figures out what they reveal and what they do not reveal. He is an economist by trade. This background allows him to see discernible patterns that are hidden to most of us. His writings have equipped me with a series of questions that I ask myself when confronted with any issue or anyone speaking about an issue. Here are the questions. -Is what is being compared, comparable? – Numbers? In what context? – Can someone be ethical while being political and can someone be unbiased while being an advocate? – What is important is not what decision should be made? The real question is who is to make the decision? Through what process? Under what incentives and constraints? With what feedback mechanism? If you remember these questions the chances of being fooled decreases exponentially. Although Dr. Sowell does not write his weekly column anymore, fortunately for us he is still writing books. Dr. Sowell has written a new book titled “Discrimination and Disparities“. Dr. Sowell is being interviewed by Peter Robinson in this interview on Uncommon Knowledge. It will be a great investment of your time to listen to Dr. Sowell in this interview. Thomas Sowell: Wealth, Poverty and Politics, at austianaddict.com. Thomas Sowell: “Economic Problems Don’t Have Political Solutions”, at austrianaddict.com. Thomas Sowell: Vision Of The Anointed, at austrianaddict.com. Thomas Sowell: The Economics And Politics Of Race, at austrianaddict.com. Michelle Obama vs. Thomas Sowell On The Politics Of Race, at austrianaddict.com. The ‘Disparate Impact’ Racket By Thomas Sowell, at austrianaddict.com. Thomas Sowell: Human Capital More Important Than Physical Capital, at austrianaddict.com. If you type Thomas Sowell in the search box you, will be treated to more of his writings. I came across this video which edits Old Movie Stars Dancing To Uptown Funk. This is great editing by Nerd Fest UK. I bet you replay this. Thomas Sowell retired from writing his weekly column two weeks ago. Some of my favorite columns he writes are his ‘random thoughts’ columns. His last random thoughts column was titled “Random Thoughts, Looking Back” (Click here). Thomas Sowell retired last week from writing his weekly column for Creators Syndicate. I wrote about this earlier in the week in this post ( The Great Tomas Sowell Says Farewell To His Weekly Column ). Dr. Sowell is my favorite author. I try to read all his stuff, which is difficult because of the staggering amount of material he has written. Dr. Sowell does two things that are difficult when you write. 1) He makes complex and abstract concepts understandable to regular people like me. 2) He economizes on words while revealing this high degree of insight. I heard someone say this about a particular writer he admired (I can’t recall who it was). This applies to Dr. Sowell. “I know the same words that he knows, but I can’t put them in the same order that he does“. I am so happy that Dr. Sowell’s mind sees things the way it does. His writing has brought much enjoyment to me over the years. I have compiled some of my favorite quotes from what he has written. Here are a few. Here are some questions that Dr. Sowell says should be asked when analyzing a topic or discussing a particular topic with another person. Is What Is Being Compared Comparable? Who Is To Make The Decision? Through What Process? Under What Incentives And Constraints? With What Feedback Mechanisms? Here are some short phrases from Dr. Sowell. -Economic Problems Don’t Have Political Solutions. -Perfect Justice Means Perfect Tyranny. -Virtually Everything Is Foreseeable In Retrospect. -Every False Diagnosis Of A condition Is An Obstacle to Improvement. -Feedback Serves To Limit The Impact Of Errors. -Sober Analysis Seldom Has The Appeal Of Ringing Rhetoric. -History Is By Definition Tardy. -Don’t Confuse Causation With Morality. -It Takes A High I.Q. To Evade The Obvious. -Many People Have Credentialed Ignorance. -We Can Only Make Our Choices From Alternatives That Are Actually Available. -Moderation Is Great, Unless It Is Taken To Extremes. -What Is True Is Not Always Popular And What Is Popular Is Not Always True. -Liberalism: Let My Conscience Be Your Guide. -Everything Is The Same Except For Its Differences; and Everything Is Different Except For Its Similarities. -The Question Is Not Whether The Glass Is Half Full Or Half Empty. The Question Is, Was The Glass Full Of Empty When You Started? Here are some longer quotes about economics, freedom and politics. -The abstract existence of knowledge means nothing unless it is applied at the point of decision or action. -Knowledge is one of the scarcest of all resources in any economy, and the insight distilled from knowledge is scarcer still. -Decisions differ because of the internal preferences and the external incentives facing those who make the decisions. -Results observed at a given point in time may be part of a process that stretches far back in time. -Envy used to be one of the seven deadly sins before it became one of the most admired virtues under its new name, “Social Justice”. -The first lesson of economics is scarcity: There is never enough of anything to satisfy all those who want it. The first lesson of politics is to disregard the first lesson of economics. -History is not a record of people’s articulated intentions being realized so much as it is a record of entirely different things happening as a net result of mutual innumerable strivings toward mutually incompatible goals. -The God like approach to social policy ignores both the diversity of values and the cost of agreement among human beings. -Just as a poetic discussion of the weather is not meteorology, so an issuance of moral pronouncements or political creeds about the economy is not economics. -People who are very aware that they have more knowledge than the average person are often very unaware that they do not have one tenth of the knowledge of all of the average persons put together. In this situation, for the intelligentsia to impose their notions on ordinary people is essentially to impose ignorance on knowledge. -Any attempt to have rational discourse requires that those with different views have a common language in which to discuss their differences. -The anointed are on their tiny island of knowledge, surrounded by their sea of ignorance. -The anointed are insulated from the feedback of uncooperative reality. -The anointed are often wrong, but never in doubt. -Intellectuals are masters of the world of unverified plausibilities. -It takes considerable knowledge just to realize the extent of your own ignorance. -When you want to help people you tell them the truth. When you want to help yourself, you tell them what they want to hear. -Wherever we want to go, we can only get there from where we are, not where we think we are. Not where we think we are, or wish we are, or where we want others to think we are, but where we are in fact right now. If we don’t have truth we don’t have anything to start with, and build on. Political spin and pious euphemisms don’t tell us where we are. -If you have a right to someone else’s approval, than they do not have a right to their own opinions and values. -The fatal misstep of intellectuals is assuming that superior ability within a particular realm can be generalized as superior wisdom or morality over all. -The intelligentsia and others always fight phony wars against straw men. Why create a false issue, except to evade the real issue? -In political competition what is being sold is not an end result, but a plausible belief about a complex process. Ergo accurate knowledge has no such decisive competitive advantage. -The free market may work vest when there is a level playing field. But politicians win more votes by tilting the playing field to favor particular groups. -Tests are not unfair. Life is unfair and the test measures the result. -The test conveys a difference that already exists. It doesn’t create a difference that would not exist otherwise. -People have to be aware of the dangers in letting economic decisions be made through political processes. -The argument for Socialism, it sounds great; the argument against it, it doesn’t work. -Anyone can be wrong about the future. But being wrong about the past is something else. -If an informed citizenry is the foundation of democratic government, than an uninformed citizenry is a danger. -Systemically evolved freedom in Colonial America later became intentionally preserved freedom in the Constitution of the United States. -Constitutional guarantees encumber the state precisely so that the state may not encumber the people. -More severe penalties that are not enforced are not as good as less sever penalties that are enforced. -Lowering standards for those unable to meet them only endangers the very benefits those standards produce. Standards do not exist for no reason. -Freedom has always been embattled where it has not been wholly crushed. -A border dispute between Ohio and Indiana does not keep us from knowing that Columbus is in Ohio and Indianapolis is in Indiana. -Each ethnic group tends to trail the long shadow of its own cultural history, as well as reflecting the consequences of external influences. -Wealth in the U.S. is not distributed at all. People create it, earn it, save it, and spend it. -Survival in the market often requires recognizing mistakes and changing course, while survival in politics often requires denying mistakes, continuing the current policies and blaming the bad consequences on others. -Free markets efficiently allocate scarce resources which have alternative uses. This results in higher standards of living for society as a whole, along with unequal rewards to individuals, industries and regions. -The effectiveness of the market does not depend on Government officials or intellectuals understanding it. -The biggest difference between economic decisions in the market, and political decisions in Government is that costs are an inescapable factor in economic decisions, while political decisions can ignore costs. -Voluntary decision-making processes have many advantages which are lost when courts attempt to prescribe results, rather than define decision-making boundaries. -Nothing is easier than to confuse broader powers with deeper insight. But almost by definition, those with the broadest powers are the most remote from the specific knowledge needed for either deciding or for knowing the actual consequences of their decisions. -Sometimes the ascribed status to a particular group is preferential, so that sorting and labeling that is biased in the proscribed direction is legal but any bias in a different direction is not. -The word “crisis” has virtually become a political synonym for “situation” and indicates little more than something that someone wants to change. -Social crusaders are not forced to confront the consequences of their choices, even in their own minds, or consciences, much less pay a tangible price for he havoc they leave in their wake while feeling noble. -Many complaints that some basically good Government policy has been applied stupidly may fail to address the Underlying problem of catagorical laws in an incremental world. -Nothing human has ever achieved perfection. So the fact that intellectuals can always imagine something better than the vest that exists in reality is hardly surprising. -Justice of any sort, criminal justice as well as so-called “social justice”, implies the imposition of a given standard on people with different standards. -What is politically defined as economic planning is the forcible superseding of other people’s plans by Government officials. -The claim that costs are “prohibitive” is to miss the whole point of costs, which is precisely to be prohibitive. Costs transmit inherent limitations of resources compared to the desires for them, but do not create this fundamental disproportionately. -All costs are prohibitive to some degree, and virtually no costs are prohibitively absolutely. -Where prices are set by Government fiat, they convey no information as to ever-changing economic trade-offs…. Price changes are virtually instantaneous, while statistics available to planners necessarily lag behind. -If prosperity could come only from the united efforts of upright and noble-minded people, all of mankind would still be sunk in poverty. -Everyone must live in the world of reality. To the extent that reality has been filtered to fit a vision, this filtered information is a misleading guide to making decisions in an unforgiving reality, to which we must all adjust because it is not going to adjust to us. -The same man is not equal to himself on different days, much less at different periods of life. If this seems like a lot, this is just the tip of the iceberg. If you can remember some of these statements by Dr Sowell, especially the questions that should constantly be asked, you will start seeing the world through a different lens. I was out-of-town last week when I heard that my favorite author was retiring from writing his weekly column. I decided to wait until I had time to think, before I wrote anything about Dr. Sowell retiring. I had never heard of Thomas Sowell until one day in 1995 I was listening to Walter E. Williams guest host for Rush Limbaugh. 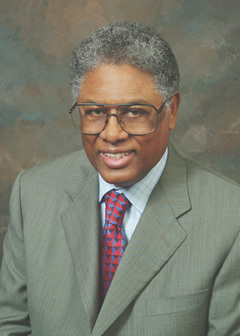 He said he was going to talk to his friend Dr. Thomas Sowell about his new book titled, “The Vision Of The Anointed”. I had been reading Walter E. Williams columns in the local paper for years and decided to make sure I listened when Dr. Sowell was being interviewed. The discussion between Dr. Williams and Dr. Sowell about this book captivated me to the point I went out and purchased the book as soon as I could. The clarity in which Dr. Sowell articulated complex issues had me hooked. It was crack cocaine to me. I had to have more. I read a book he wrote in 1987 titled, “A Conflict Of Visions”. Then I read “Knowledge and Decisions” a book he wrote in 1980. From there I had to get my hands on everything he wrote. I have 34 books by Dr. Sowell. He has laid the foundation for me to read and understand Hayek, Mises, and Rothbard. I had read F.A. Hayek’s, “Road To Serfdom” before I had read anything by Thomas Sowell. I didn’t know how little I had understood in Road To Serfdom until I reread it after I had read Dr Sowell’s books. I know Dr. Sowell is retiring from his weekly column, but I hope that he will keep turning out his books. His weekly columns are written for regular people like you and me. They are not written for academics as some of his books are. His weekly columns have been must reads for me for years. I will continue to have his blog archives on my blog roll. They are a great source for information. Thomas Sowell has published 6 books containing his best weekly essays. I have all 6 of these books. Here is a list, with links to Amazon. Pink And Brown People, and other controversial essays. 1977-1980. Compassion Versus Guilt, and other essays. Ever Wonder Why, and other controversial essays. The most amazing thing when you read these older books of essays, is the fact that nothing has changed. We are still fighting the same ideological battles today as we were in the late 70’s. His essays are as relevant today as they were when they were written. Here is what he wrote in his last column titled, “Farewell“. Here are a few excerpts from essays in his book titled “Pink And Brown People”. These essays were written from 1977 to 1980. You tell me if this is relevant today? 1977 – Who Says Bureaucracy Is Inefficient? Is it worse or better since 1977? Their has only been a change in degree not kind. What is going on now is no different than Dr. Sowell’s observations of what was happening in the late 70s. These problems have only expanded in size and scope. We didn’t listen to the warning. I will be writing about Thomas Sowell over the next week or so. This man opened my eyes to a different world view than the one being pushed by the ruling aristocracy, the main stream media, and the intellectual class. I am convinced that if a person is shown both world views, he will choose the one Dr. Sowell articulates. I’m reposting an aritcle titled, D-Day Plus 70 Years, from June 6, 2014. I saw a show on the History Channel this past weekend and it got me thinking about the men who were involved in the Normandy invasion code-named Operation Overlord, especially my uncle Bill. Staff Sergeant William Sackenheim, was a paratrooper in Company E 508th Parachute Infantry Regiment 82nd Airborne Division. He jumped into Normandy approximately 1:30 am on June 6 1944 with the mission to take the town of Ste.-Mere-Eglise. When I was growing up I just knew my Uncle Bill as a man who seemed larger than life, was really funny, and lit up the room he was in. I was always laughing within seconds of seeing him. My mom told me he was a paratrooper in WWII and was awarded a purple heart, but I didn’t know much more than that until I was much older. About the time of the 50th anniversary of D-Day in 94, my brother and I were talking to my uncle at a funeral, and a man named Earl came up and they started talking. My uncle said ” Earl remember where the hell we were 50 years ago.” And Earl smiled and said “yes”. So I asked if he was a paratrooper like my uncle, and he said “no”. My uncle said “Earl was in one of those ships he flew over crossing the channel to make his jump.” I said you landed on one of the beaches on D-Day and he said “yes, Omaha”. My uncle said Earl was captured by the Germans, and I asked “what happened”, thinking he had maybe been a prisoner the whole war, and Earl said “oh, I escaped, I had to get the hell out of there”. I’m thinking you just don’t leave, there has to be a great story here. But I didn’t get to ask any more questions because Earl had already started talking to other people. So my brother and I talked to my uncle a little more about D-Day and then asked if we could come over to his house in a couple of days, and he could tell us about D-Day and the war. Two days later we talked with my Uncle Bill for four hours about the war. One theme that always came up was how soldiers next to him got killed. He would always say “why was it him and not me”. I finally understood why my uncle seemed larger than life, it’s because he actually was larger than life. Not only did my Uncle Bill jump on D-Day, he jumped in Operation Market Garden in Holland, and was in the Battle of the Bulge in The Ardennes in Belgium. He also saw the atrocities at Buchenwald. My uncle Bill passed away a few years ago, and soon the living monument that is the WWII generation will be gone, and we will only be able to read their stories. My brother and I were lucky that we got to listen and see our Uncle Bill tell us about his experience.